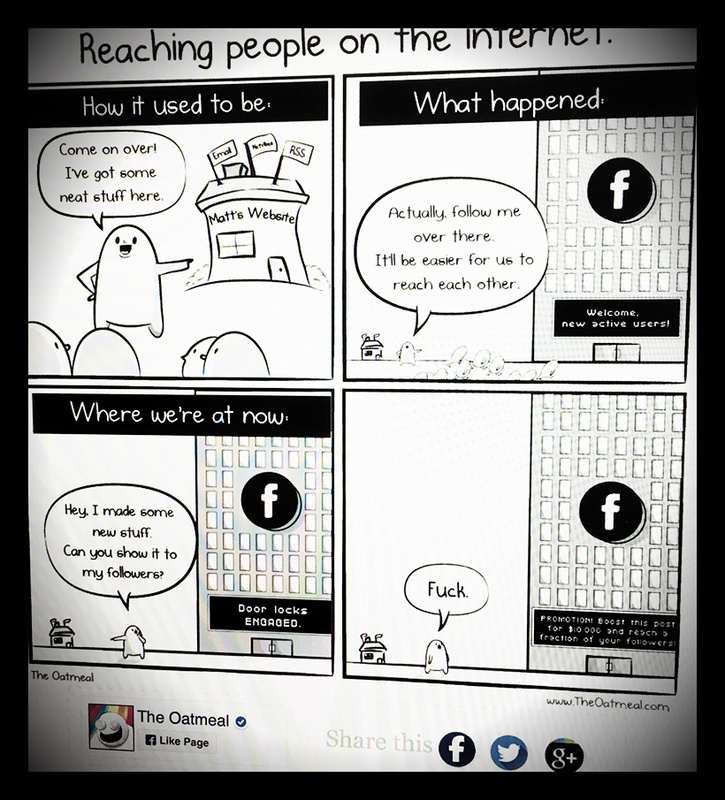 The Oatmeal: "Promotion: boost this post for $10.oo and reach a fraction of your followers!" Encontrámos no espaço de poucas horas duas vezes este artigo entre referências de duas fontes em áreas que, apesar de dispares, cada vez mais se tocam: desenvolvimento web, e indie publishing (livros). Fica o resumo, mashup nosso. The original vision for the Web was a space with multilateral publishing and consumption of information, a peer-to-peer vision with no dependency on a single party. From the 90s until the 2010s, the Web we have experienced has been, albeit somewhat imperfectly, faithful to its original purpose. The Web’s diversity has granted space for multiple businesses to innovate and thrive, independent hobbyist communities to grow, and personal sites to be hosted on whatever physical servers can host them. The Web’s openness is vital for its security, accessibility, innovation and competitiveness. After 2014, we started losing the benefits of the internet’s infrastructural and economical diversity. The Web began dying in 2014: what has changed over the last 4 years is market share of traffic on the Web: GOOG and FB now have direct influence over 70%+ of internet traffic. E porquê-porquê? Mobile, uma evolução tech com consequências sociais. Já reparaste lá fora como as pessoas andam dobradas de cabeça para baixo? Mobile internet traffic is now the majority of traffic worldwide [and] mobile devices are primarily used for accessing GOOG and FB networks. Os gigantes: Apple, Microsoft, sobretudo FB, Google, Amazon. These are no longer the same companies as 4 years ago. GOOG is not anymore an internet company, it’s the knowledge internet company. FB is not an internet company, it’s the social internet company. AMZN does not focus on making profit, instead its mission is to seek market leadership, crushing competitors: AMZN is the e-commerce company. Sem backbone: ISP, aliados (temporários) a esses, os resquísios de empresas que ainda não foram espremidas para fora do mercado enquanto tiverem também elas o seu monopólio, neste caso físico. Internet Service Providers (ISPs) are probably soon going to dictate what traffic can or cannot arrive at people’s end devices. GOOG-FB-AMZN traffic would be the most common, due to their popularity among internet users. ISPs will likely provide cheap plans with access to GOOG-FB-AMZN, while offering more expensive plans with full internet access. 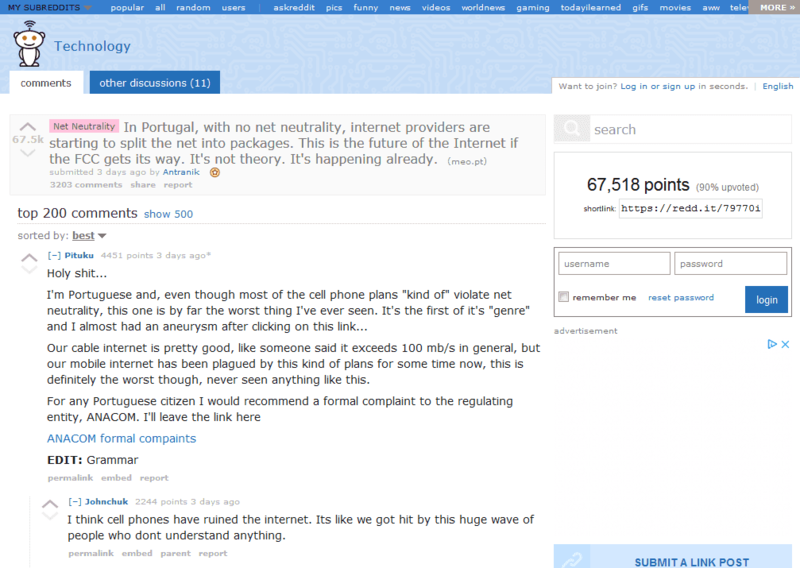 It is already a reality in Portugal. This would grow even more the dominance the three tech giants already enjoy. There would be no more economical incentive for smaller businesses to have independent websites, and a gradual migration towards Facebook Pages would make more sense. 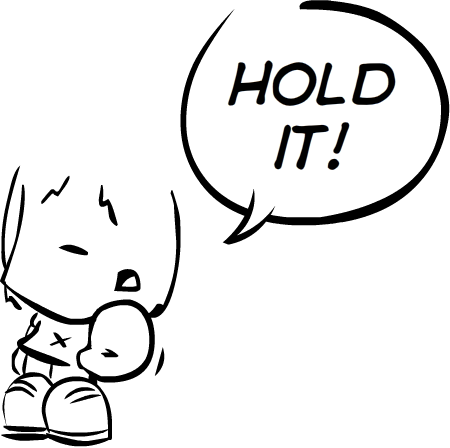 Smaller e-commerce sites would be bought by AMZN or go bankrupt. Because most internet users couldn’t open all the sites, GOOG would have little incentive to be a mere bridge between people and sites. Exemplo: Google Not web, AI. For many years, Google used to be just a tool that played the important role of assisting the Web, by indexing it. Lately, however, it is not attractive for Google to be a mere search engine of the Web: the search engine approach has been exhausted. GOOG’s goal is to gather as much rich data as possible, not specifically to have websites provide information. Any GOOG concerted efforts are aligned to the AI mission. GOOG promotes lock-in and proprietary technologies, proprietary protocols, proprietary hardware, walled gardens, they shutdown Google Reader based on RSS, an open standard. GOOG in 2014 started reorganizing itself to focus on artificial intelligence only. GOOG sees no future in the simple Search market, and announces to be migrating “From Search to Suggest”. GOOG’s shift away from Search is a sign how they are growing their strategy beyond the Web. Their goal is to cut the middlemen in that path. With AI, they believe they can shorten the path to just one step, “get information”, even without searching for it in the first place. That’s the purpose of Suggest. The Suggest strategy is being currently deployed through Google Now, Google Assistant, Android notifications, and Google Home. None of these mentioned technologies are part of Web, in other words, not part of “browser-land” made of websites. Like Google Home, Amazon Echo bypasses the Web and uses the internet just for communication between cloud and end user. In these new non-web contexts, tech giants have more authority over data traffic. Fim da web: "the Appleification of tech giants"
marketing the design while designing for the market. The next wave of walled gardens might look different: less noticeable, but nonetheless disruptive to the Web. The common pattern among giants is to grow beyond browsers, creating new virtual contexts where data is created and shared. The internet will survive longer than the Web will because it is a technical success. That said, many aspects of the internet will lose their relevance, and the underlying infrastructure could be optimized only for GOOG traffic, FB traffic, and AMZN traffic. It wouldn’t conceptually be anymore a “network of networks”, but just a “network of three networks”: a Trinet. In the long-term, supporting routing for the old internet and the old Web would be an overhead, so it could be beneficial to cut support for the diverse internet on the protocol and hardware level. Access to the old internet could be emulated on GOOG’s cloud accessed through the Trinet, much like how Windows 95 can be today emulated in your browser. ISPs would recognize the obsolence of the internet and support the Trinet only, driven by market demand for optimal user experience from GOOG-FB-AMZN. Conclusões a reter. Primeiro: tech e cidadania, direitos, politics! The Web may die like most other technologies do: simply by becoming less attractive than newer technologies. And like most obsolete technologies, they don’t suddenly disappear, neither do they disappear completely. The Web’s death will come as a gradual decay of its necessity, not as a dramatic loss. 25 years of the Web has gotten us used to foundational freedoms that we take for granted. We forget how useful it has been to remain anonymous and control what we share, or how easy it was to start an internet startup with its own independent servers operating with the same rights GOOG servers have. Segundo. Nada aqui deveria ser-vos uma novidade: big tech, ISPs, open web, tha worx? e, lembram-se daquela nossa outra fixação? Os media. The most popular web properties that don’t belong to GOOG nor FB are usually from the press. From where do media sites get their traffic? Prior to 2014, Search Engine Optimization (SEO) was a common practice among Web Developers to improve their site for Google searches, since it accounted for approximately 35% of traffic, while more than 50% of traffic came from various other places on the Web. SEO was important, while Facebook presence was nice-to-have. In 2017, the Media depends on both Google and Facebook for page views, since it’s the majority of their traffic. In 2014, FB built Facebook Paper as an attempt to have a larger control over news consumption. Their tactic failed, but their strategy persisted through different means such as Facebook Instant Articles. GOOG launches their Instant Articles alternative called Accelerated Mobile Pages (AMP) and proactively starts serving articles from GOOG servers instead of directing traffic to media sites. Se não acompanham o tema, os Instant Articles e o AMP são vendidos aos media como uma "mais valia" para eles. Isso. Mas antes de lhes relegar um escárnio de esclarecido ante a anta, recordamos: o Google, FB, et al, também te vendem os seu préstimos com igual sentido. Faz sentido disso. 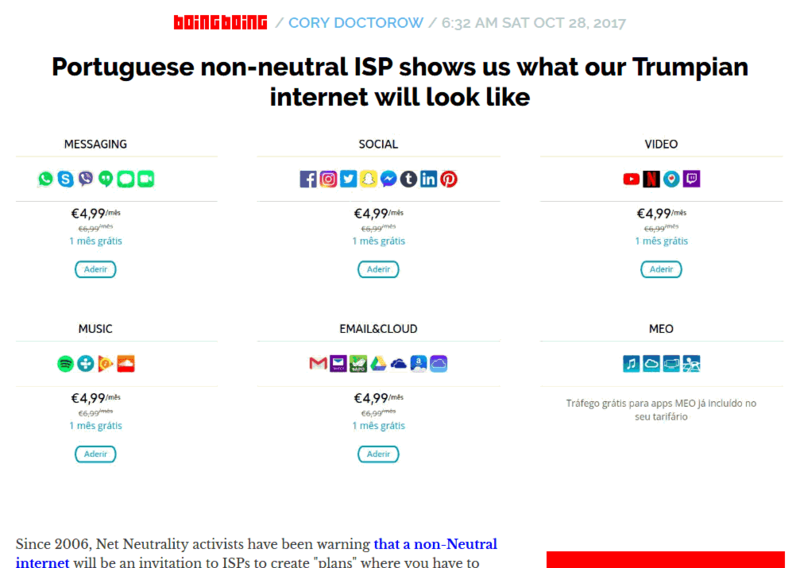 E de fazer sentido e coincidências, igualmente em dois dias duas peças sobre Portugal, mesmo tema: MEO e neutralidade web.